According to his contract, Joey Porter will be a Cardinal for two more years after this season. He will be paid a guaranteed $17.5 million, with a total contract value of $24.5 million. So far, Arizona is not getting their money’s worth. After a down 2007-2008 season in Miami, during which Porter only recorded 5.5 sacks (his lowest total since 2003), the veteran had a bounce back year in 2008-2009. In what would be his final season in Miami, Porter recorded a career high 17.5 sacks, obviously creating a fresh market for his services when perhaps his stock was dwindling. Porter, therefore, hit free agency with the most sacks in the AFC and the second most in the NFL the previous season. Arizona, of course, was made to endure considerable turnover in their linebacker and overall pass rushing core. Karlos Dansby turned Arizona’s offer down on route to Miami. 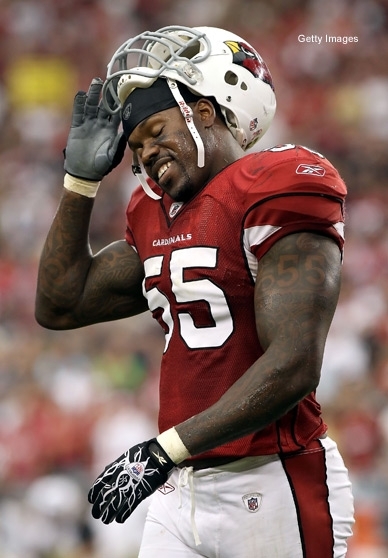 In addition, Chike Okeafor and Bertrand Berry, upon whom the Cardinals had relied to generate pressure, both retired leaving a yawning chasm where Arizona’s pass rush once was. There was little doubt that the Cardinals were going to have to make some kind of splash on the free agent market in terms of an outside linebacker, especially since Arizona was firmly invested in its 3-4 scheme. So, on March 18th of this year, the Cards signed Porter hoping he would be at least a shadow of the same guy that Whisenhunt knew in Pittsburgh. It would be unrealistic to think he would post 17.5 sacks in 2010, but at least generating consistent pressure and grabbing the occasional sack every two games or so was not an overly demanding expectation. Obviously, this hasn’t happened. It’s an unfavorable development that has Porter scratching his head. “Trust me, I’m beating myself up every day because I watch myself on film,” Porter explained. “I’m so used to being in a position to make plays. It’s what I’ve done my whole career, so when you go through a stretch like this where you haven’t been able to make impact plays, you start to wonder ‘what are you doing wrong? '” Porter revealed. There’s no doubt that the veteran understands the importance that a play maker brings to a team. “A playmaker can change the game, sometimes by himself,” Porter explained. “When you are counting on a guy and he comes through for you, there is no bigger joy for that to happen and the energy flows through the whole team.” So far, however, Porter hasn’t been able to provide his team with this boost. He has only 1 sack through five games, though he does have a forced fumble to his credit. Stopping the run will no doubt make an entire defense more effective, but rushing the passer, perhaps more than many other aspects of the game, is a uniquely individual effort. Usually, when a team gets consistent pressure on opposing quarterbacks, it’s because of a single defensive player, like Clay Matthews for instance, that will not be denied. Getting more than one of these “undeniable” players pushes your pass rushing towards elite status, but a team at least needs a superstar building block; a keystone that can be relied upon to get pressure no matter the situation. The great pass rushing teams have at least one such player. In terms of Davis’ argument, consider the following. Of the top ten teams in sacks, five teams (the Steelers, Seahawks, Chargers, Giants, and Titans) are also in the top ten in rushing yards allowed per game, including the number one and two ranked teams in that category (Pittsburgh and Seattle). I don’t think 50% necessarily vindicates Bill Davis’ theory, especially considering the Lions, Packers, and Eagles aren’t even in the top 20 in rushing defense. It seems to me that sacks and pass rushing is more an individual effort by proven play makers that show up week in and week out. Seattle seems like as good a place as any.